Financial statement ratios — such as the gross margin ratio — provide useful ways to interpret the financial reports of a business. You calculate these financial ratios by dividing one particular number in the financial report by another (you won’t find this ratio listed in the report itself). Making bottom-line profit begins with making sales and earning sufficient gross margin from those sales. The gross margin must cover the expenses of making sales, operating the business, and paying interest and income tax expenses, so that there is an adequate amount left over for profit. So a business with a $158.25 million gross margin and $457 million in sales revenue (see the following figure) earns a 34.6 percent gross margin ratio. In their financial reports, public companies include a management discussion and analysis (MD&A) section that should comment on any significant change in the gross margin ratio. But corporate managers have wide latitude in deciding what details to include. You definitely should read the MD&A section in a financial report, but it may not provide all the answers you’re looking for. You have to search further in stockbroker releases, in articles in the financial press, or at the next professional business meeting you attend. Business managers pay close attention to margin per unit and total margin in making and improving profit. Margin does not mean gross margin, but rather it refers to sales revenue minus product cost and all other variable operating expenses of a business. In other words, margin is profit before the company’s total fixed operating expenses (and before interest and income tax). Margin is a very important factor in the profit performance of a business. Profit hinges directly on margin. 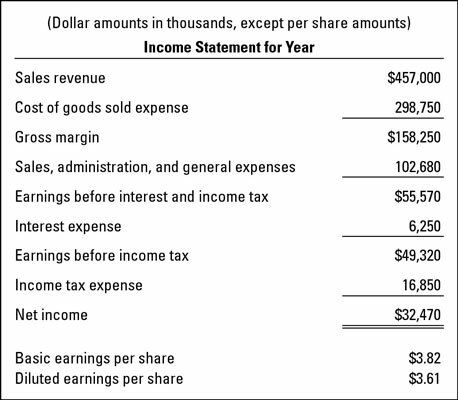 The income statement in an external financial report discloses gross margin and operating profit, or earnings before interest and income tax expenses. However, the expenses between these two profit lines in the income statement are not classified into variable and fixed. Therefore, businesses do not disclose margin information in their external financial reports. This information is considered to be proprietary in nature; it is kept confidential and out of the hands of competitors. In short, investors do not have access to information about a business’s margin or its fixed expenses. Neither GAAP nor the SEC requires that such information be disclosed — and it isn’t! Nevertheless, stock analysts and investment pundits make the best estimates they can for the margins of businesses they analyze.